Having just returned from a 13 hour road trip late Saturday night, I was ecstatic to find this collection waiting in a box in my foyer when I walked through the door. 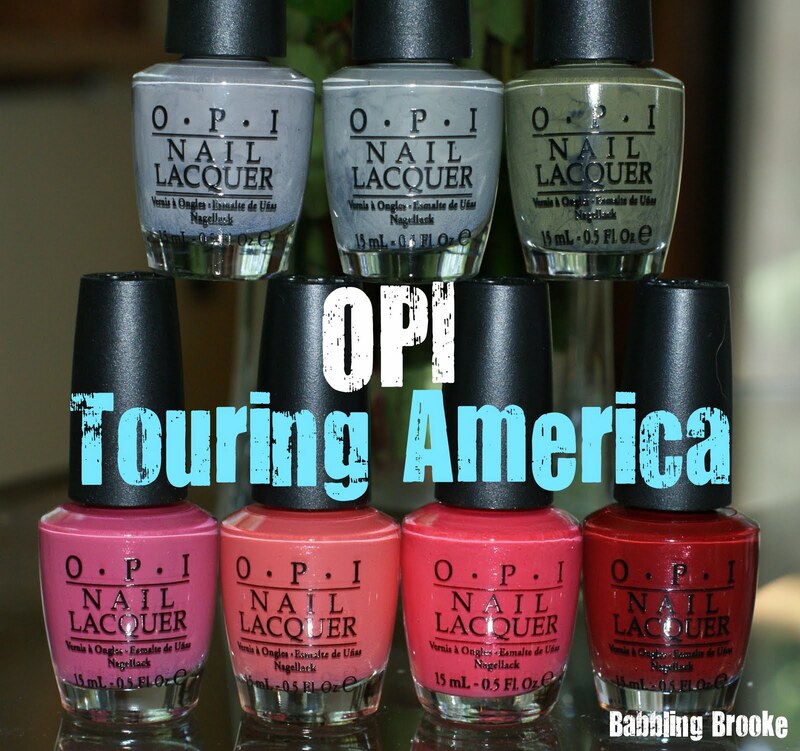 OPI's Touring America takes us on a trip across our vast and exciting country. It is filled with a wide variety of colors and a multitude of finishes, and I am just as excited seeing the colors on my nails as I was when I got the initial press release many months ago. In this post, I have all of the shimmers and three of the cremes; later today I will post the rest of the collection (you can see it by clicking HERE!). For each swatch, I used two coats. The polishes dried quickly and all had a really nice shine. Check out the swatches below and let me know what you think! Beautiful light pink rose with gold shimmer. A true old-Hollywood glamour. I love everything about this polish - the color, the glitter, and the name. Another favorite in this collection, I Eat Mainely Lobster is a fabulous bright, orangey pink (a little reminiscent of OPI My Chihuahua Bites). It is filled with pretty, teensy shimmer like My Address is Hollywood, Are We There Yet?, and Color to Diner For. This name fits this polish perfectly. Color to Diner For is I'm Not Really A Waitress' cousin. Dark red with tons of shimmer and a hint of copper and oh-so pretty. I can just see a waitress wearing this pretty shade at a roadside burger joint. French Quarter For Your Thoughts is a pretty light gray creme. This one is very similar to French Quarter, except it has a hint of green, which didn't show up too well in pictures. If I were to choose between the two, I prefer French Quarter. Honestly, I hate the name (is this supposed to be puke-colored? ), but I love the color. This is a great army green creme that is fabulous for fall and warm up my fair-weather hands. 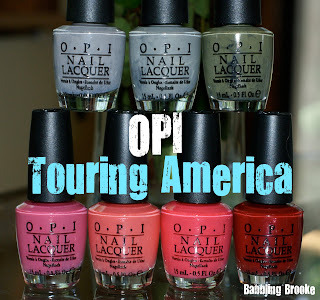 OPI's Touring America Collection is available at Sephora, Ulta, and most nail salons. Learn more at OPI.com. Which Touring America shades are your favorites?